I wanted to talk about Covenant Theology before continuing in Romans so as to establish a framework for some of the things we had focused on in the first six chapters as well as for upcoming discussions in the middle chapters of Romans. My definition of a biblical covenant is this: an absolute relational bond of faithfulness initiated, defined, and administered by God, involving obligations and benefits. This differs somewhat from traditional covenant definitions. For example, O. Palmer Robertson (author of The Christ of the Covenants) defines a covenant simply as a bond in blood, sovereignly administered. My definition obviously includes a couple of his points. It is a bond, and it is sovereignly administered. My definition explained further, however, that the biblical covenant is always identified (or initiated) by God. It is also defined by God. I didn't, however, make the point that it is a bond in blood. Although almost all covenants spoken of in the Bible specifically as covenants usually portray the blood connection, I intentionally left that out of my definition because God, who involves Himself in covenants, does not bleed (of course, I'm speaking of God as Spirit, not the incarnate Son). The blood in covenant language is a sign that the covenant-taker pledges his or her life that he or she will keep the covenant. God's pledge to keep the covenant is an absolute obligation to which He commits Himself. Therefore, I opted for the adjective "absolute" to describe this life or death oath-taking. Now, although the Bible does not speak of God's eternal decisions as covenants, I believe they actually can be classified as such. They happen to fit the definition. For example, the overarching decision by God to create is a covenant commitment established by God among the Trinity. I then call this the Covenant of Creation--an agreement of the Godhead to act in faithfulness, obligating themselves to this act for the benefit of eternal relationship, joy, and glory through their creation. (Note: although we usually refer to God with a singular pronoun, I used the plural here because of the distinction of all Persons of the Trinity in the covenant agreement.) The initial act of God in creating physical existence, including universe, earth, and humankind, I refer to as the Covenant of Relationship. The Fall then occurred. God, in absolute faithfulness to His Covenant of Creation and the benefits anticipated, initiated the Covenant of Reconciliation with His creation. That reconciliation included the accomplishment of redemption (Christ and the cross/resurrection) as well as the application of redemption (by grace through faith to humankind). Thus reconciled, the relationship is restored. In fact, the new relationship has become stronger (which was the original intention of God) as the redeemed in the reconciliation have become children of God through adoption by the Spirit. This new relationship, part of God's covenant among the Godhead, I call the Covenant of Restoration, which will last for eternity to come. 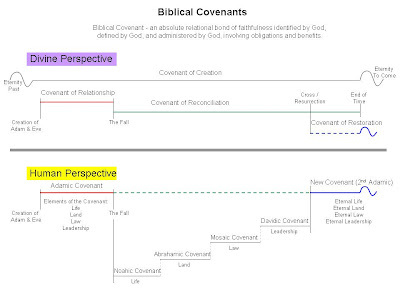 The chart below is divided into covenants of (or among) the Godhead (above the shaded line) and covenants between God and humankind (below the shaded line). We have just discussed the covenants of the Godhead. Now let's look at the covenants between God and His creation. The first is the Adamic Covenant. This, of course, is between God and Adam and Eve in the original state of creation. God initiated, defined, and administered this bond of faithfulness in which were benefits of life and land (the Garden--and the world), as well as obligations of law (not eating from the tree) and leadership. Leadership is an interesting obligation. I believe it is seen directly in God's command for Adam and Eve to have dominion over creation. But in maintaining God-ordained order, Adam and Eve had a responsibility to govern themselves as well to ensure the law was kept. With only one dominant law, the leadership aspect over themselves is not so clearly recognized. We may see it more clearly in multiple laws of multiple people where governance does not only imply enforcement or punishment for breaking of the law, but also organization and control. Adam and Eve were obligated with the control of life in the Garden. But, of course, the Fall came. Specifically, the covenant was broken by failure to maintain the obligation or law. As we learned earlier concerning the nature of covenants, breaking the bond of faithfulness results in death. And so, Adam and Eve were condemned. But according to the intra-Trinitarian covenant, God immediately initiated His plan of reconciliation. We find four major covenants progress through the Old Testament. The first is the Noahic Covenant. It is also an absolute bond of faithfulness with obligations (Gen 9:4-5) and blessing (Gen 9:16). The emphasis of this covenant that we see in both the blessing and obligation is Life. In the Abrahamic Covenant, we see the covenant procedure most fully. The Hebrew expression for making a covenant is actually "cutting" a covenant. This refers to the procedure shown to us in Genesis 15 in which animals are cut in two and laid on the ground with a pathway separating them. Normally, the parties to the covenant would walk together through the divided parts symbolically obligating themselves to the death in keeping the agreement. The Abrahamic covenant also had obligations (Gen 17:1-2). This covenant's emphasis was on possession of the Land (security; provision). Of course we know the Mosaic Covenant had obligations. The books of Moses are filled with them. As such, the emphasis of this covenant is the Law. Finally, the Davidic Covenant and its obligation (I Kings 2:4) had the emphasis of Leadership. Thus, we can see that the four emphases in benefit and obligation of the Adamic Covenant (Life, Land, Law, and Leadership) are worked out through the four major covenants of the Old Testament involved in God's Covenant of Reconciliation. We know that in each of these four covenants that God established with humankind, failure occurred. Sin reigned among the creatures. The covenants were broken in every instance by everyone. Of course, death is the result of broken covenants. But what we see in the Old Testament is God acting in relationship with humankind, seemingly "passing over" their sins. Was God just in doing so? The answer that we find in Romans 3 is absolutely Yes. In due time, God sent His Son to take on the form of a man so that He was fully human, living sinlessly, keeping all the obligations of all the covenants, fulfilling all righteousness. This perfect Covenant-Keeper then took on the sin of the world, dying for it (paying the consequence of broken covenant) in our place. We, the actual covenant-breakers, then had imputed to us the righteousness of the Covenant-Keeper. This, then, is one reason why Paul said in Romans 3:21-25 that God was just in passing over former sins. Christ also showed God's righteousness in how God kept His obligations of the covenant. Back in Genesis 15 where we saw the covenant procedure take place, both God and Abraham did not walk through the cut animals together. Only God moved as a flaming torch along the covenant path. By doing so, God vowed that He Himself would keep both His obligations AND Abraham's obligations of the covenant. And with Christ's perfect life, He accomplished that very thing. The New Covenant established by Christ promises Eternal Life, Eternal Land, Eternal Law (the law of the Spirit of life - Rom 8:2), and Eternal Leadership by the King of kings and Lord of Lords! Covenant signs both signify the covenant and provide a seal to it. The sign of the Noahic Covenant is the rainbow. The Abrahamic covenant sign is circumcision. The 10 commandments is the covenant sign of the Mosaic Covenant. And the sign of the Davidic Covenant is the throne. The not-so-clear sign is the one for the New Covenant. Many Presbyterians (as well as some others) believe that baptism is the sign of the New Covenant. Thus, since initiation into the Abrahamic covenant community was performed by the sign of circumcision shortly after birth, so too do they initiate a child (an infant) into the New Covenant community through baptism. The baptism of the infant for the Presbyterian does not make a person a Christian any more than circumcision of the Israelite infant sealed his redemption. Baptism is, they argue, merely a sign of entrance into the community of covenant believers. I disagree with this position for two reasons. The first is that circumcision was given as a sign to Abraham as part of a promise of God's faithfulness to Abraham's children. As such, the newborn of Abraham's house and lineage were rightfully given the sign of entrance into that covenant community. In the New Covenant, however, Christ is the fulfillment. When we join in the New Covenant, it is again through birth, except not a physical one. Based on the fulfillment of the ighteousness that Christ accomplished, being born into His covenant community is a spiritual birth, not a physical one like in Abraham's covenant community. Thus, the sign should be given at spiritual birth rather than at physical birth. That is an argument against the logic of infant baptism. But I believe my second reason of disagreement is actually more compelling. My contention is that baptism should not be related to circumcision because baptism is not the sign of the New Covenant. Each covenant sign/seal (1) was given by God at the establishment of the covenant and (2) stood as a sign with the covenant people throughout the covenant relationship. Baptism does not fit. It was not given at the establishment of the New Covenant (although Christ did tell His disciples to baptize), and it is only a one time event; it does not continue as sign throughout the covenant relationship. Now consider the gift of the Holy Spirit. The Holy Spirit was given at the events of initiation of the New Covenant (from after the resurrection (John 20:22) through establishment of the ministry of the Church (Acts 2)). The Holy Spirit, through the fruits of the Spirit, does provide a sign throughout the covenant relationship. And further, Scripture seems to support the gift of the Holy Spirit as the sign/seal. I believe, therefore, that the sign/seal of the New Covenant is the indwelling Holy Spirit.